Gastonia hotel recognized as best hotel in Gastonia, North Carolina area. Nestled in the heart of Gaston County, Courtyard Charlotte Gastonia is easily accessible to Interstates 85 & 485. The hotel offers a full array of amenities with Marriott's high standards of service and a touch of its own Southern hospitality. Each year the Gaston Gazette publishes the “Best of Gaston” guide to the best places to eat, shop, relax and more in Gaston County, North Carolina. The publication asks the public to nominate businesses in 145 categories and awards the “Best” designation to those businesses that win the most votes. In recognition of its outstanding service and amenities, the Courtyard by Marriott Charlotte Gastonia was voted the best hotel in Gaston County by Gaston Gazette readers. 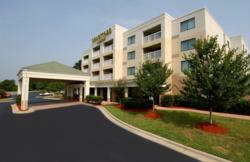 The Courtyard by Marriott Charlotte Gastonia is nestled in the heart of Gaston County and is easily accessible to Interstates 85 and 485. The hotel offers a full array of amenities with Marriott's high standards of service and a touch of its own Southern hospitality. The Courtyard Gastonia provides spacious guest rooms equipped with large work desks and wireless internet, hot breakfast buffet, indoor pool and fitness room. The hotel has five meeting rooms ideal for corporate meetings or social gatherings. The large Ballroom accommodates up to 200 people and is perfect for weddings and special occasions. With attention to detail, a commitment to service and a great location just minutes from the Charlotte International Airport, Lowes Motor Speedway, U.S. National Whitewater Center and Daniel Stowe Botanical Gardens, the Courtyard Gastonia has much to offer today's business and leisure travelers alike. The Courtyard by Marriott Charlotte Gastonia is locally owned and operated by JHM Hotels.